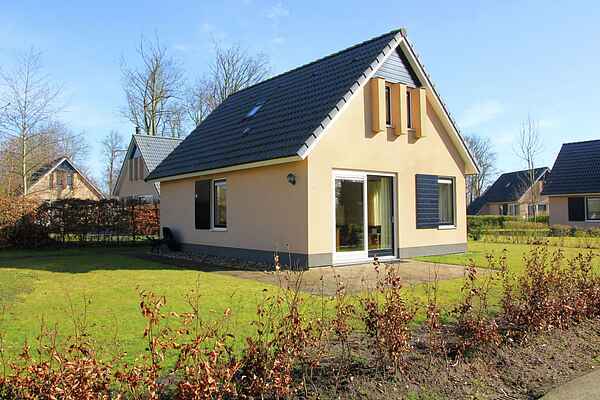 This nice holiday home is peacefully located on a small park in the Frisian village Sondel, near the IJsselmeer and the Frisian lakes. The light facade combined with the blue roof give this holiday home its friendly appearance. The furnishing is well-kept. The big windows allow much light to come into the spacious living room. The beautiful open kitchen is fully equipped. Outside you can enjoy the sun on the terrace while the children play on the lawn. The surrounding area is ideal for cycling and hiking. And do you think of a visit to the charming villages and cities in the area, such as Balk, Lemmer, Oudemirdum, and Sneek? But the older Frisian cities such as Hindeloopen, Workum and Stavoren are also worth a visit. Enjoying the sun, swimming and surfing: it's all possible on the IJsselmeer. Or rent a boat and take a boat trip along the always impressive Frisian lakes! Do you love golfing? Within five kilometers distance of the holiday home you can enjoy yourself on a unique 9-hole natural golf course.